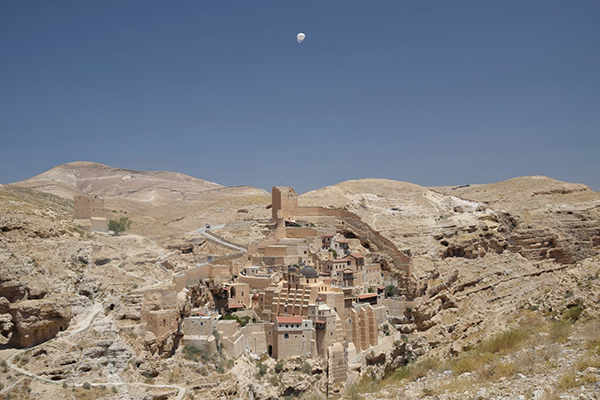 Photo of Deir Mar Saba in the West Bank, with UC San Diego helium balloon carrying remote camera above the monastery to capture more than 600 high-resolution images. The photos were later used by Ph.D. student Matt Howland with structure-from-motion software to create 3D computer model of the site (see below). San Diego, February 23, 2017 — Good archaeologists typically have to imagine what an archaeological site would have looked like based on whatever an excavation uncovers. But trying to visualize the scene mentally is getting much-needed support as archaeologists gain access to “new tools to stoke imaginations,” according to an article in the new online magazine Mach, now being beta tested by NBC News Digital. “They’re experimenting with virtual reality and augmented reality to bring ancient and historic sites back to life,” wrote the article’s author, Megan Gannon, in the February article. Levy directs the Center for Cyber-Archaeology and Sustainability (CCAS), based in UC San Diego’s Qualcomm Institute. The center is funded by a $1 million University of California Catalyst grant. CCAS brings together professors of archaeology and their students from UC San Diego and three other UC campuses: UCLA; UC Berkeley; and UC Merced. Still frame from flythrough video of valley leading to the Mar Saba monastery. Click here to watch the video on YouTube. 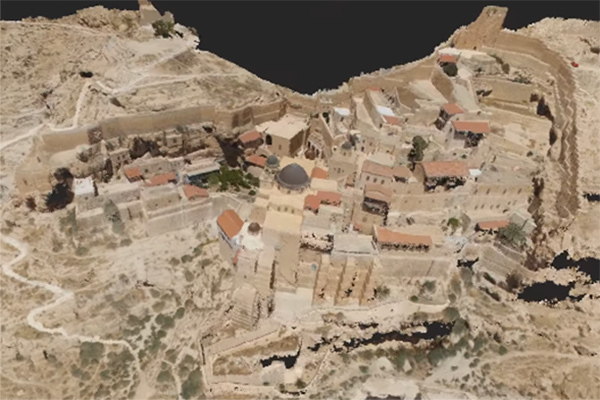 Levy’s team used ground and aerial photography to capture 3D images of Deir Mar Saba, the largest monastery in the Judean desert, dating back to the 5th century. Anthropology Ph.D. student Matt Howland, a participant in CCAS, used images taken from a balloon above the monastery and merged them together using structure-from-motion software to create a 3D computer model of Mar Saba and its surroundings. 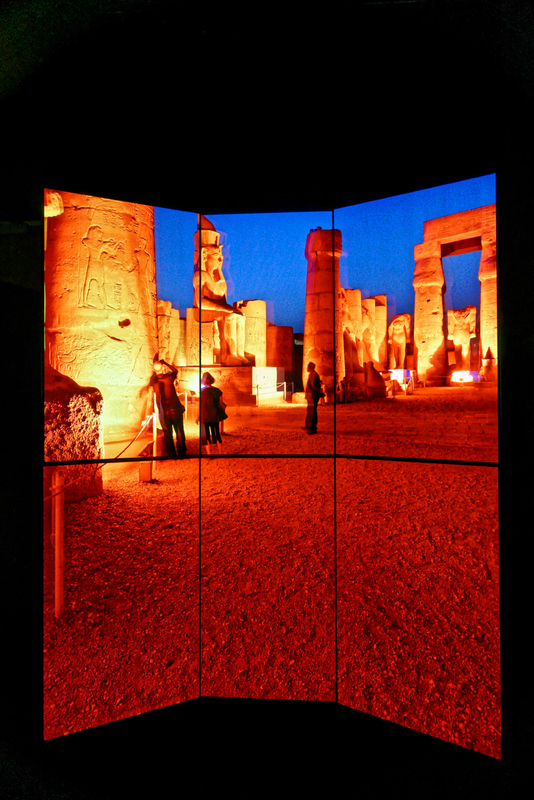 Indeed, by making the images into a computer model that is compatible for viewing in virtual reality (i.e., in 3D), Levy’s team is making it possible for the public to explore the site using an Oculus Rift headset device, or by standing in front of an immersive 3D wall display such as the CAVEkiosk developed by the Qualcomm Institute. The first kiosk was recently deployed on the ground floor of UC San Diego’s Geisel Library, which allows students, researchers and the public at large to call up archaeological visualizations on the walls of the kiosks, or to take a guided virtual tour of sites in some of the eight countries where CCAS member faculty are working. CAVEkiosks and other VR systems are also being installed beyond UC San Diego on all the campuses represented in CCAS, i.e., in Berkeley, Los Angeles and Merced. Undergraduates from the UC San Diego Virtual Reality Club are also deeply engaged in CCAS research using personal VR devices such as HTC Vive, Oculus Rift and Google Cardboard. As the Mach article points out, “behind the scenes, the Qualcomm Institute also has several VR interfaces with which archaeologists and other researchers can step inside shipwrecks or dig sites in ways that would otherwise be physically impossible.” The reference is to other 3D VR environments developed by Qualcomm Institute research scientists Thomas A. DeFanti and Jurgen Schulze, both of whom are affiliated with CCAS (Schulze as a co-PI). The VR systems include the StarCAVE, NexCAVE, TourCAVE and WAVE displays, as well as the large-scale 2D Vroom wall system. In addition to the interview with CCAS director Tom Levy, the Mach article recounts a number of digital reconstructions. The article noted half a dozen virtual reality or augmented reality apps, including Ancient Jerusalem (as it was in the first century), a Roman fort, a Bronze Age roundhouse in Scotland, Beijing’s Forbidden City, and even a view from Canadian troop positions in the trenches of a World War I battlefield in northern France.